You can choose from a number of techniques, depending on your situation. Sometimes, you need to maintain animation for example; other times, you just need static slides. Here are some methods you can use. In the Save As dialog box, click the Save as Type drop-down box and choose the JPG or PNG option. You can change the file name if you want or keep the default name. At the dialog box asking if you want to export every slide or the current slide, click Every Slide. Click OK at the dialog box that tells you were the image files were saved. PowerPoint creates a subfolder for them. 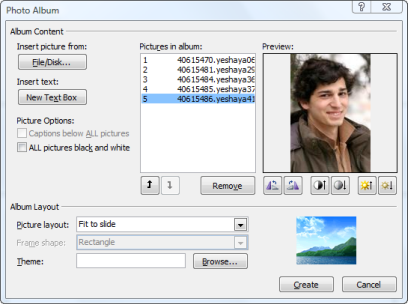 You’ll return to the Photo Album dialog box. In the Album Layout section, choose the Picture Layout you want. Usually, you’ll choose Fit to Slide or 1 Picture. Click Create. PowerPoint inserts one image on each slide and creates a title slide, which you can then delete. Save the presentation. PowerPoint 2010 makes this easier. Choose File> Save As. In the Save As dialog box, click the Save as Type drop-down list and choose PowerPoint Picture Presentation (*.pptx). That’s all there is to it! In PowerPoint 2010, choose File>Save & Send> Create PDF/XPS Document>Create PDF/XPS. PowerPoint Tips file protection, file security, microsoft office, powerpoint. permalink. Windows Secrets Newsletter: How to Get a Deleted File Back?